A key EHS metric is Total Recordable Incident Rate (TRIR). TRIR gives the company a look at the organization’s safety performance by calculating the number of recordable incidents per 100 people. The lower the TRIR, the better a company’s safety performance appears. Your company may be required to calculate and report this metric to OSHA. Regardless, companies can benefit from tracking this metric year by year to improve their safety initiatives. Why Is the Total Recordable Incident Rate Metric Important? TRIR gives you direct insight into your company’s safety performance. But your internal EHS department isn’t the only one interested in this particular metric. If your TRIR scores are poor, it can lead to an uptick in surprise OSHA inspections and fines. In addition, OSHA may increase their oversight in your company’s EHS programs. Your insurance company may use TRIR data to determine your premiums. The higher your recordable incident rate, the more you could be paying for insurance. Prospective employees may investigate your company’s safety performance, including TRIR scores. A high TRIR could signal a company’s lack of focus on employee safety and become a potential barrier to talent sourcing. In addition, companies considering you as a vendor may be put off by a high TRIR score. They may see a business with a lower TRIR score as more favorable because it’s a testament to their safety record. Given its impact across multiple channels of your business, it’s important you not only understand how to calculate your TRIR, but also how to keep this score as low as possible. OSHA uses TRIR to gauge a company’s safety performance. The resulting calculation reflects the number of incidents per 100 employees at any given time. TRIR looks at the number of total recordable incidents and compares it to the number of total hours worked by all employees in a single year. In this case, a recordable incident is any work-related incident that results in death, injury, or illness. The 200,000 is the benchmark established by OSHA because it represents the total number of hours 100 employees would log in 50 weeks based on a 40-hour work week. 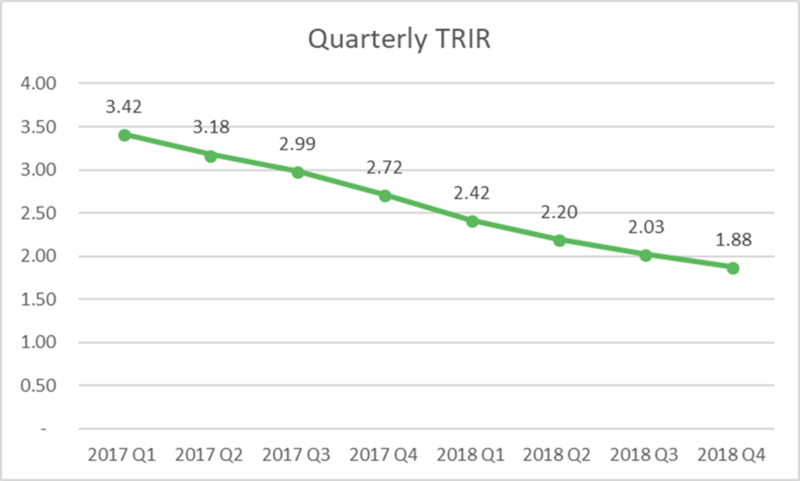 TRIR showing a downward trend. In this example, the TRIR is 1.88. Your employee’s health should always remain a core focus, and ensuring your business maintains a safe work environment is a large part of this effort. If your TRIR score is above a 7, you could be susceptible to an OSHA inspection. These inspections typically scrutinize every part of your company’s health and safety program, including employee training records, written programs, required record keeping, audits, routine inspections, observations, and other documents. If your company is using EHS software, you will likely have all of the above (and more) already stored in your central knowledge management system. Having this information readily available in the event of an OSHA inspection can lend credibility to your efforts to maintain a low TRIR. In addition, using EHS software to track your TRIR score and other parts of your EHS program can help you determine a potential problem before it earns attention from OSHA. You get a better idea of your safety performance and can make adjustments as you go. To see how EHS Insight can help you achieve a better TRIR score, request a free trial of our all-in-one EHS software solution today.